There are many things to like on a pop up canopy tent. It’s a great choice when your event involves a bunch of people as it’s able to keep them covered and sheltered, no matter if it protects them from the sun or some light rain. If a canopy tent is difficult to use for a larger event, it’s not the case with a pop-up canopy tent that is a lot easier to install. First thing you need to know when you get your pop-up canopy tent is the amount of space you need for the event. This is going to give you an idea about the size you need for your pop-up canopy tent. It’s not that complicated and you may count the chairs you need for the event so that you get an idea about the amount of coverage it’s necessary. You also have to think about if you need straight leg or slant leg canopy tent. They may look the same, but a slant tent looks more elegant and sleek. Their legs to take more space and the canopy itself doesn’t cover the whole designated space. On the other hand, straight leg tens are more dependable and have better stability. It’s important to know if your pop-up canopy tent has to be waterproof or water resistant so get a weather forecast before making a decision. The more you’re willing to pay, the more you may expect from your pop-up canopy tent. Either we talk about the durability of the sidewalls or the poles, the accessories that come along or the lifespan of the canopy, it’s important to also know how much you’re willing to pay for it. 1). Are you planning a party for one of your kids and you’re in need for a bright, pretty colored pop-up canopy tent? Well, your party is ready to be a great hit thanks to the Merax Patio Easy Pop-Up Canopy Tent 10 x 10 FT Portable Folding Canopy. The pop-up canopy tent sure makes a nice impression in any garden as it comes in such pretty colors. Despite its lightweight build, the tent has good stability and may take a light wind. It presents a corrosion resistant powder-coated steel frame, so it may take a beat. The square-shaped roof gives an impressive 96 square feet of shade, whereas the slant leg design doesn’t just look pretty, but also offers good stability. The tent is made to take the use for quite some time. The top of the canopy tent offers 99% UV protection from the bad UV rays. We also like the tent as it comes with its own roller bag and it’s easier to pack and carry around. It’s easy to put together and to take down as it folds nice and easy. The pop-up canopy tent is well made and is a great choice for a kid’s party, family barbecue, weddings or other nice events. It comes with frame, top, stake kit and a helpful roller bag. Despite the minor issues, for its stability, ease of use and nice appearance, you shouldn’t miss it for your next family party. 2). For those of you planning a trip to the beach next days or simply camping, give it a go with the Quick Shade GO Hybrid Compact Slant Leg Backpack Canopy. The pop-up canopy tent gives 36 sq. oh shade and has a 6×6 fabric top. Don’t let the lightweight build fool you as the tent is pretty sturdy and its corrosion resistant powder-coated steel ensures its stability. The tent is only 14lbs. so it’s very easy to carry around. Let’s not to mention the backpack with zippered pockets that make transportation a breeze. The backpack is made with 600D polyester so it takes the long time use. The tent features lever tab activated pushpins that offer 1 height position and a maximum height of 5ft. 10 in, with eave clearance of 4ft.5 in. The 3-piece telescoping leg design with 3 height adjustments make the tent versatile, fitting your needs in various situations. The 170T fabric top features Aluminex coating that provides 99% UV protection. The sewn-in back panel gives you privacy and a lot more shade as well. The pop-up tent also comes with M5 hardened rivets and has a one-piece frame with rigid roof structure. The tent comes with canopy frame, canopy top and a half panel wall. 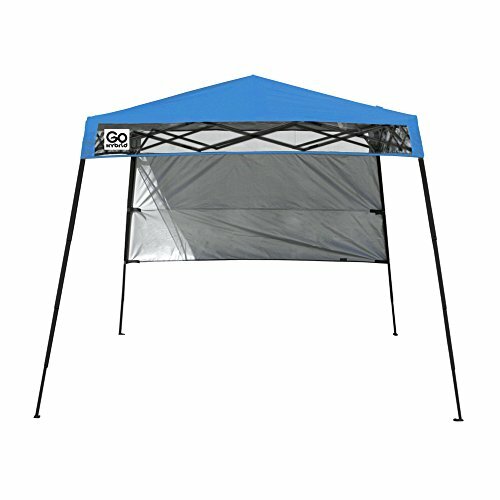 The pop-up canopy tent is easy to set up and has a good size. It’s compact when folded and is great to take on the beach. All in all, for the money you pay, you get an adjustable, easy to carry and set up tent that serves you well in many situations. 3). 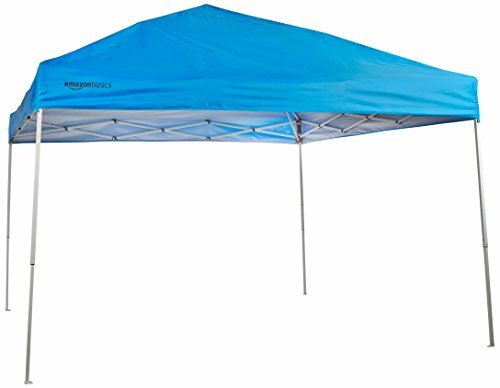 Only by taking a quick look at the details of the AmazonBasics Pop-Up Canopy Tent helps, you understand why it’s so popular out there. The pop-up canopy tent comes with a steel frame that gives good stability, whereas its cathedral roof increases the headroom. The high-grade steel frame with powder coat finish minimizes risk for chipping, rust, corrosion and peeling. The angled led design offers 96 sq. of shade and its top provides 99% UV protection from the sun’s dangerous rays. The design without sidewalls creates an open-air feel, without minimizing your protection against the sun. The tent resists water and the pointed profile helps water not to pool, directing it away. The pop-up canopy tent folds down and fits in most trucks for easier transportation. It comes in a nice black bag that also includes a frame, canopy and stakes. The carrying bag has wheels so even if you feel the tent sits on the heavyweight side; it’s easy to carry it around. Even though you may find it tricky at first, only one person may install the canopy tent. It’s easy to adjust the height and to take down as well. The corner poles look sturdy and so does the fabric that is pretty thick. Durable, easy to install, large and highly portable, this is one pop-on canopy tent you shouldn’t miss when shopping. 4). Lightweight and highly portable, the E-Z UP SR9104BL Sierra II 10 by 10-Feet Canopy brings many good things to the table and only few foibles got our attention. The tent is economical and presents an angle leg design, a 10’x10’ footprint, and an 8’x8’ at top. The folding steel frame makes the setup easy peasy and you don’t need to put together any loose parts. You don’t need any ropes or tools for assembly either. The white powder-coated steel frame provides stability and durability to the tent. The slant-leg design increases the stability and the tent is great for all sorts of outdoors events. The E-Z Glide truss washers are also important for the stability. The fabric top is a CPAI-84 fire resistant type and keeps 99% of the UV rays away from you. We also have to mention the toggle leg adjustment, which means you, may set 2 heights for the tent, according to your needs. The high-strength end caps are durable and take the intense use. The Auto Slide Pull Pin is a nice feature that lets you have quick lock and release. The tent is well made and the design is well thought-out. It comes with helpful roller bag and spike kit. 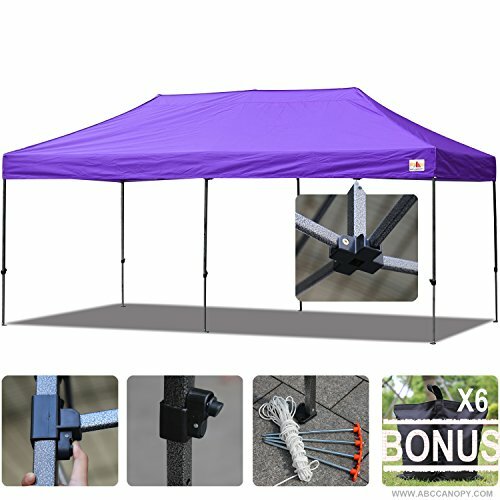 All in all, the pop-up canopy tent comes with many good things to consider and only few issues that are easy to manage. 5). 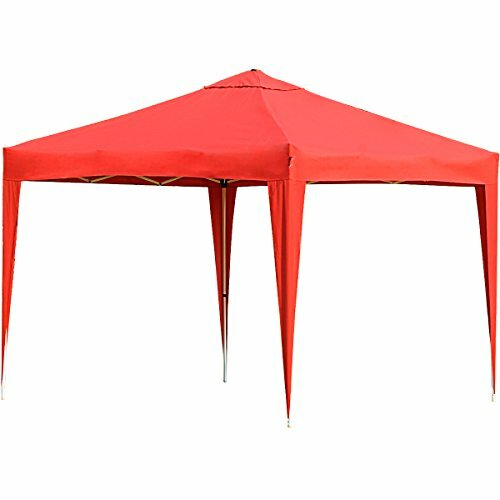 The list of good features of the Abba Patio 10 x 10-Feet Outdoor Pop up Portable Shade Instant Folding Canopy with Roller Bag is pretty long and you shouldn’t miss the opportunity of trying it. 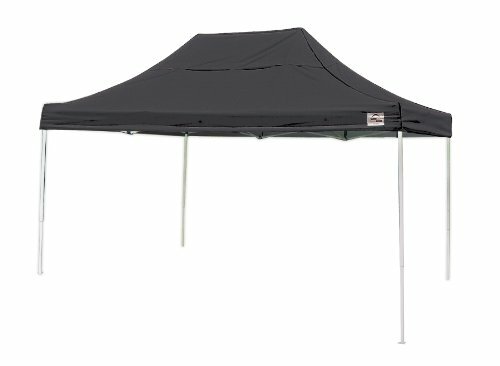 The canopy tent is water resistant and it’s made from 300D Oxford strong fabric that protects against UV rays. It’s a sturdy tent that includes a high-grade steel frame with powder coat protects against rust, corrosion, peeling and cheeping. When it comes to the design, there are also many nice things to notice. The high eaves give large head room and you may use the extra stakes and lines when it gets too windy, in order to get more stability. The finger-friendly toggle locks ease up the use, whereas the canopy fabric comes with reinforcements to protect against the frame rubbing holes in it. We also notice tough Velcro and a top vent for efficient airflow. The nylon cording and links attached on the outside and anchor are great details. The carry bag is expandable and has extra zipper so you may easily fit in the tent, shrinking the bag up with the extra zipper for a tighter fit. The pocket for the stakes is a nice touch and the sturdy handles are also to mention. The tent is also lightweight so it’s easy to take down and put away for storage. It comes with a wheeled bag that increases its portability, but it packs small so it fits most trunks out there. You may use it for recreational events or commercial ones also. Reliable, durable and easy to use, the pop-up canopy tent is a good option for many. 6). The looks of the Abccanopy Kingkong-series 10 X 10-feet Commercial Instant Canopy Kit Ez Pop up Tent may be its best strength, but the tent does come with many other good things attached to it. The black powder-coated rush resistant steel frame doesn’t just give stability and durability to the tent, but also looks nice. The tent also features 100% nylon mold brackets and thick square shaped legs that increase the stability. The truss bars are strong and the nylon feet come with two drilled holes. The push button sliders are smooth and safe and every spare part is stocked. The canopy material is 100% waterproof and the seams are heat-sealed. 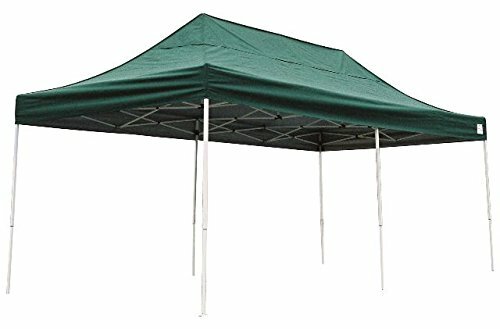 The material is 300-denier polyester with PU lining and the stress points are reinforced so that the poles don’t poke the canopy. The carrying bag is durable and its zipper is tough, whereas the two handles make transportation so easy. It’s easy to set the canopy tent up and we totally like its appearance. Despite the small problems, we still like the pop-up canopy tent for its easy use, stability and, let’s not forget, its pretty looks. 7). The heavy-duty build of the 10×15 Straight Leg Pop-up Canopy, American Pride Cover turn it into a reliable, ready to take a windy day kind of pop-up canopy tent. 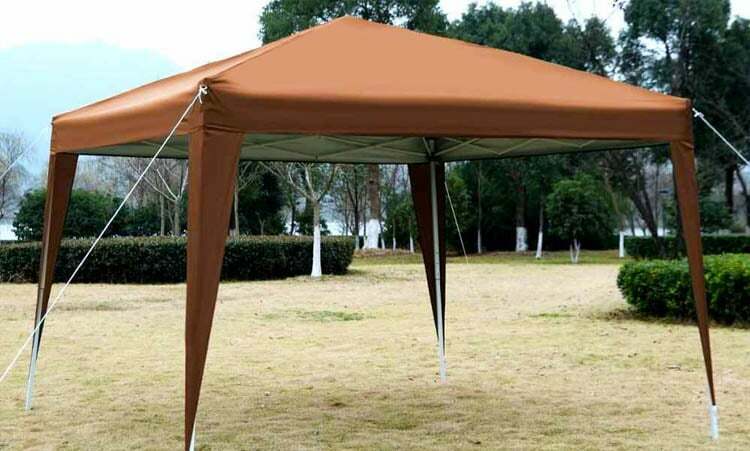 The tent comes with high-grade tubular steel frame and its DuPont powder coated finish lowers the risk for rust, corrosion, peeling, and chipping. We also notice the 4 positions adjustable frame that gives strength and stability to the canopy tent. The wide based foot pads on each leg increase the stability and gives you easy access when securing the anchors. The polyester fabric canopy is UV treated inside and out with fade blockers, anti-fungal agents and anti-ageing agents as well. The canopy presents a 50+ UPF sun protection and keeps at distance 98% of the dangerous UV rays. The pop-up canopy tent offers you no less than 150 sq. of coverage and it’s not just big and sturdy, but also nice looking. It takes the outdoor elements and is very secure, handling a windy day. Sturdy, reliable, safe and offering nice shade, the pop-up canopy tent is a good investment to make on for your special events. 8). 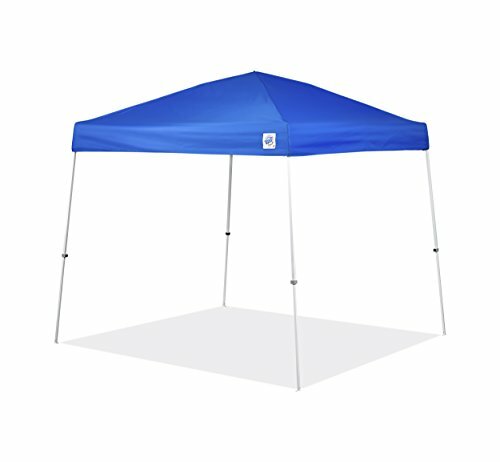 When in need for a pop-up canopy tent for some family event like a large backyard party, you’re your money at stake with the Shelter Logic 10×20 Straight Leg Pop-up Canopy. The canopy tents is 10x20ft. In addition, presents a 4 position adjustable frame. It’s made with rugged tubular steel frame that offers good stability and strength. We also notice the wide based footpads on every leg that create a solid base. You also get easier access to the anchors when securing them. The cover is made with polyester fabric that is UV treated in and outside. The fade blockers, anti-fungal agents and anti-ageing agents extend the lifespan of the cover. The 50+UPF sun protection keeps away 98% of the risky UV rays. The polyester cover is also water resistant and handles the elements pretty well. We like the strong build and the nice appearance of the tent. It comes with a carrying case that increases its portability. The case is very well organized, with several pockets and a good, functional design. 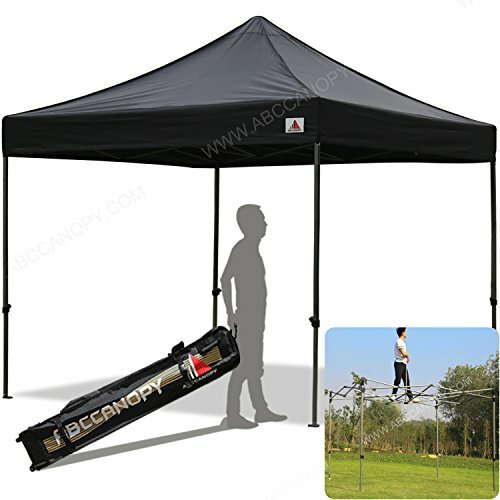 The pop-up canopy tent is well made and has a durability feel. For the stability, nice appearance and durability, the canopy tent is a dependable choice when you want to cover a large space. 9). If you’re planning a bit party anytime soon and the weather forecast doesn’t look that great, play it on the safe side and try the Palm Springs Outdoor Ez To Set Up Pop-Up Canopy with 6 Side Walls. The setup may take you a little under 5 minutes, but you may need some help from a friend for easier installation. After all, you do need to set up 6 sidewalls, 4 of them with windows and 2 doors. The two end walls are functional and so useful on an outdoor event with many guests. You attach the walls with Velcro fasteners. We also like the versatility of the canopy tent as you may easily remove the sidewalls for an open-air event, when you only want some overhead protection. The top is made with 500D heavy-duty, professional grade polyester and is UV protected. The steel frame is lightweight, but rust resistant and powder coated so it’s both strong and durable, giving stability to the tent. You get also ropes and stakes for the installation and the tent is a great choice for parties or outdoor recreational events. You may easily install it on hard surfaces, driveways, and so on. It comes with a good quality carry bag that makes it highly portable. The elegant look, the versatility and durable build make the tent a great option for the big events. For the versatility, stability and nice appearance, the pop-up canopy tent is the one to go with on a larger outdoor event in your garden. 10). Even though you may have to call for help more than just a friend and pay the extra buck, you have to realize that the AbcCanopy 10×20 Straight Leg Pop-up Canopy Commercial Grade Instant Canopy is worth every single penny. 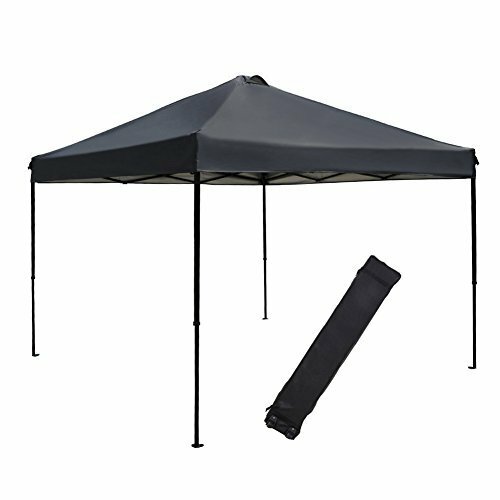 The pop-up canopy tent comes with black powder-coated steel frame t and 100% nylon mold brackets. It presents thick square shaped legs that offer impressive stability and strong truss bars. The nylon feet come with two drilled holes and the push button sliders are safe and work smooth. The canopy material is 500D polyester with PU lining and it’s 100% waterproof. The seams are heat-sealed and the stress points are reinforced so that the poles don’t poke the canopy. You may easily attach/remove the sidewalls with the Velcro along the underside of the canopy. The tent is easy to set it up, but you may need a couple of friends to do it. The tent has great stability and takes a windy day rather well. It’s very well made and holds for quite some time. It comes with a wheeled bag that matches its build. A rugged, durable roller bag presents a steel axle for higher portability. It features 2 formed rubber handles for lifting, whereas one rubber handle is helpful for rolling. The base plate is reinforced and the zipper is heavy-duty type. Durable, rugged and spectacularly looking, the pop-up canopy tent is a power horse of its kind. For the stability, versatility and impressive build, we still think this pop-up canopy tent is worth every single penny.